Sadly the Nikon EN-EL15 battery in my Nikon 1 V1 has reached the end of its working life. It happened without there being any sign whatsoever that it would die. I took some photos one day, depleting the battery in the process, and recharged it afterwards. The next day I was greeted with the following message on the camera display. What I find curious is how can the battery be dead, if the camera can power on, briefly showing the menu and all the setting I have set? Not factory settings, but my preferred settings (ISO and so on) instead? I’m now contemplating what 3rd party battery to buy. An original battery costs 60 Euros, which is about half as much used V1s go for on ebay . Right now I’m leaning towards the Bundlestar battery by Patona. Kind-of-dead? Or do they just want to sell you a new one? For my extra battery I bought a used one from Amazon for $44.99 with shipping on 4/16/14. Both of my batteries don’t hold a charge as long as they use to or so it seems. Why do these batteries cost so much. Yeah, it looks like it’s not entirely dead. The V1 powers up, shows the message, then the main menu and then the message again. There is no way to operate the camera. It doesn’t respond to button input. 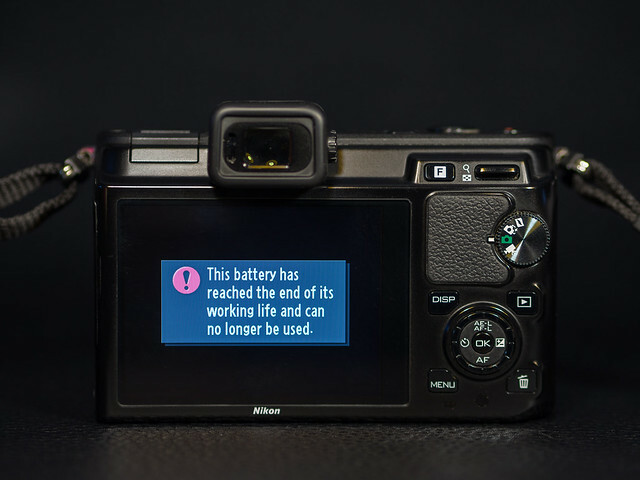 I do wonder whether this is meant to prevent the camera from taking damage or to force users to buy a new battery, which are absurdly expensive. Some 3rd party batteries only cost a 1/3 or even a 1/4. I have no idea why original EN-EL15 batteries are so expensive. I can’t imagine that they cost nearly as much to make. The EN-EL 15 will supposedly take a set number of charges depending on the camera body (different, say, for the D810 than the V1), and then reach the end of its useful life. I read that somewhere a few years back. In any event, I’ve had my spare for years now, so they last a long time too. My replacement batteries for the Nikon V2 are the ANSMANN 1400-0047 A-Nik EN EL 21, for circa 7 Euro available at amaz. I’ve bought two and use them daily, Ansmann is excellent German quality. Just a quick update: I ended up buying the cheapest battery, the ChiliPower EN-EL15 (€19). It’s working fine so far. I can’t say that there is a noticeable difference in regard to number of shots per charge, even though it offers a couple of hundred mAh less than the original EN-EL15. I will keep you guys posted. So far I have charged it only 3 times. I find that the message is misleading. I can put that same battery into another Nikon camera and it lasts quite a while there. I found elsewhere online that it was a bad battery batch.